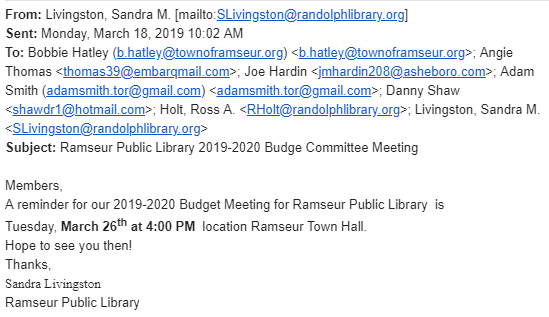 This past Tuesday, March 26, 2019, at 4 p.m., a meeting of the Ramseur Library Budget Committee was held to discuss the budgetary needs of our library in preparation for the upcoming 2019-2020 fiscal year budget ordinance. Attendees were chair, Joe Hardin; librarian, Sandra Livingston; county library representative, Ross Holt; and Commissioner* Adam Smith. 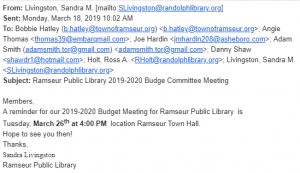 I heard about the meeting because I have requested copies of all email communications to or from our elected officials, attorney Wilhoit, and Clerk Hatley. The notice was sent out to the committee members by our librarian, Mrs. Livingston, on March 18th. 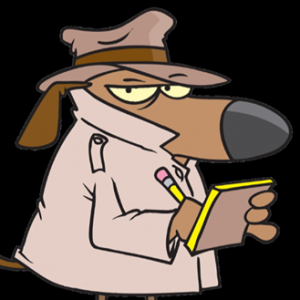 The meeting was fairly short, with a review of the library’s previous budget and discussion of areas that might need adjustment, in particular the leaking roof which is in need of replacement. That means any meeting of any advisory committee of any town department must post a public notice of the time and place of the meeting on the front door of the municipal building at least 48 hours in advance, on the town website, and on social media, as has become the custom in recent years. One would think that as long as Mayor Shaw has been serving on the board, by now he would have brought Commissioner* Smith up to speed on things like this, but I guess learning how things are supposed to be done isn’t a high priority for the current regime, I mean, administration. Commissioner Caudle has done an admirable job of announcing the times and places of the various Parks & Recreation advisory committees she oversees since they were established, but I don’t believe any meeting but the Planning & Zoning Board is regularly being posted on the door of our “town hall” or on the website. It’s time for that to change. In the future all members any committee, whether Planning & Zoning, Parks & Recreation, Library, Museum, or any other auxiliary meeting that reports to our Board of Commissioners, need to familiarize themselves with public notice requirements and other aspects of North Carolina’s open meetings law and bring their meetings into compliance.